Elica introduces Built in Hobs with Multi Flame Control (MFC) Brass Burners. MFC hobs are efficient and specifically suitable for Indian Hi flame and Simmer cooking. 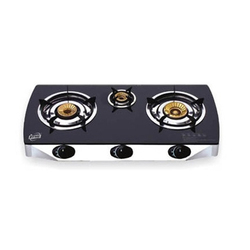 We rank on the top in by offering best quality of Three Burner Chinese Range, which is known for its remarkable finish and quality. Efficient name in the industry involved in offering the optimum quality of Triple Burner Gas Range. Matching up with the ever increasing requirements of the customers, our company is involved in offering 3 Burner Gas Stove.